Customers have been collectively overcharged by up to £6m by mobility scooter firm Pride Mobility and should be compensated, according to the National Pensioners Convention. 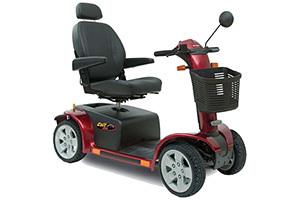 The claim follows a 2014 decision by the Office of Fair Trading that Pride Mobility breached competition law by banning retailers from advertising its mobility scooters at prices below its recommended retail prices. This ban, according to National Pensioners Convention’s (NPC) general secretary Dorothy Gibson, potentially led to customers finding it harder to get the best price. See our mobility scooter reviews to find out which models have topped our independent tests. The NPC believes that customers overpaid by an average of 13% for Pride Mobility products, which works out as up to £200 per customer including interest. It wants to bring a class action against Pride Mobility to get compensation for the estimated 30,000 people who bought mobility scooters between 1 February 2010 and 29 February 2012. But Pride Mobility argues that its actions did not have any impact on what consumers paid when they bought their mobility scooters. A hearing with the Competition Appeal Tribunal has provisionally been scheduled for December 2016, to decide whether the class action can go ahead. If you are one of the customers affected and live in the UK, you will automatically be included in the class action as a ‘class member’, and will need to opt out if the hearing gives the go-ahead for the class action and you don’t want to be included.